One of my favourite and most memorable moments from my fortunate adventures around the world so far. 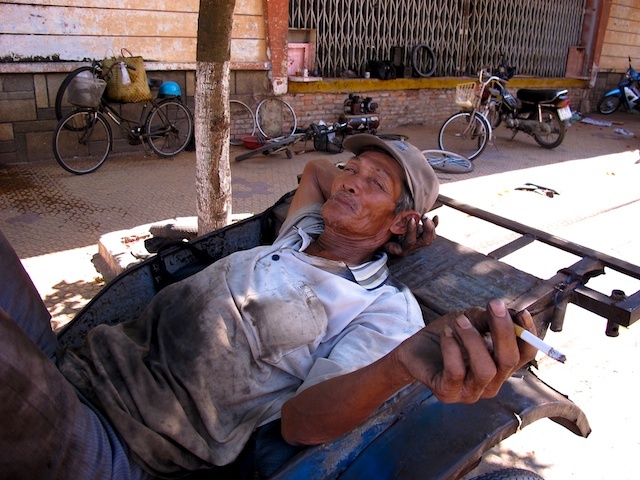 A simple exchange took place with this mechanic, as I wandered through the vibrant and colourful local market, in the city of Ben Tre, on the Mekong Delta. Skipping from one shaded part of the market to the next and I passed by him, smiling and saying hello in Vietnamese… “Chào” (pronounced “jow”). He enjoyed hearing it in my amusing Irish accent. I asked if he was happy for me to make his portrait and this is the result. Of course I was sure to give thanks in Vietnamese… “Cảm ơn” (pronounced “gam uhhn”). It’s wonderful to think what you can fit into less time than it takes to smoke a cigarette…a human connection that’s imprinted on your mind forever! An openness of spirit and the effort to learn a few words and phrases of a new language can go a long way. One day I hope to see Vietnam again. Who knows maybe we’ll cross paths again one day!